Kim Kardashian was extended a surprising level of access and courtesy. as departed in a black Chevrolet SUV parked inside White House grounds. Not normal for white house guests. 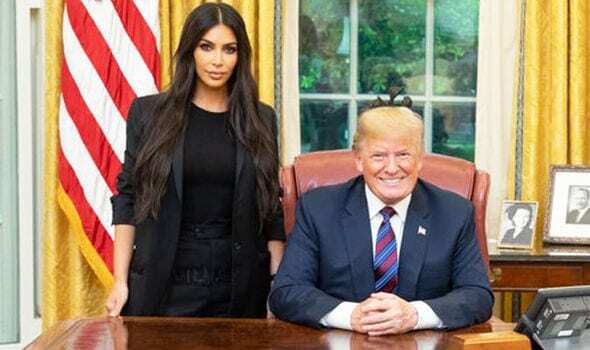 Kim Kardashian, the wife of Kanye West has met with President Donald Trump at the White House on Wednesday to discuss prison reform. Specifically to seek a pardon for a 63- year old Great grandmother, serving a life sentence. Alice Marie Johnson has been behind bars for more than two decades for a first-time drug offence. The Presidents twitter account displayed the two posing for a picture at the oval office. Kim Kardashian is also reported to have met with other officials, including senior adviser Jared Kushner, at the White House on Wednesday to discuss prison reform. Kim Kardashian first caught story of Alice Marie Johnson on social media. Which prompted the reality television to ask her lawyer to look into the case. It is understood that she has also paid for the legal team to review the case again. The reality television star has advocated for a pardon for a low-level drug offender named Alice Marie Johnson, who has served more than 20 years in prison. Earlier on Wednesday morning, Kim Kardashian West tweeted “Happy Birthday Alice Marie Johnson. Today is for you,” adding the prayer hands emoji. Kim has been touched by Alice Maria Johnson’s case and although she has expressed that she is democrat who voted for Hilary, she is determined to work with the white house on this issue. The pardon process is entirely up to the president’s discretion and so far no indication of whether the President will pardon Johnson has been revealed. Kanye West on the other hand has signaled support for Trump after he met with the then President-elect in New York in 2016. And last month, after releasing a photograph wearing a “Make America Great Again” cap, Kanye West released a song defending his praise of the President.